Luke in action in the semi-final on the way to winning the Mens Singles event. 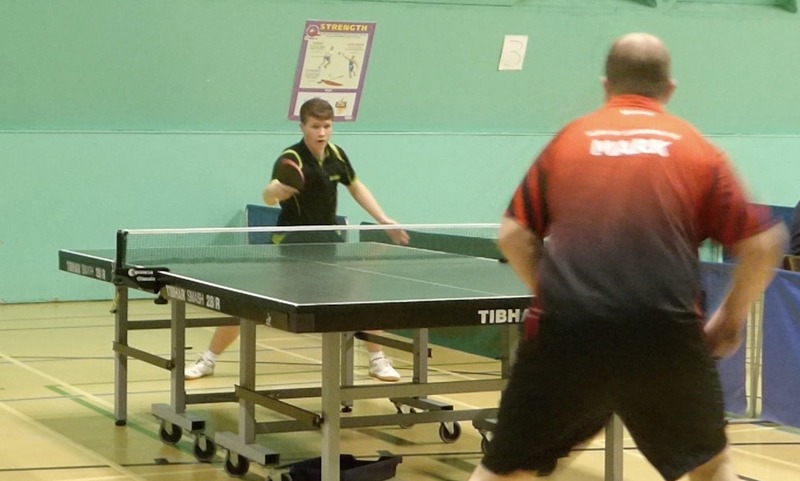 Success for Stowmarket Table Tennis Club at the 2018-19 League Championships! Our club gained more success in several events, with Luke Davies-Stokes achieving the Quadruple win of Cadet Singles, Junior Singles, Main singles and Mixed Doubles (with Izzy McGerty) events. He and Jack Samson just missed out on the Mens Doubles, losing in the final. The Division 3 event was won by Manoj Patel. The Handicap Event was won by Ian Nathan. (All results are listed at the bottom of this post). The following report was written by Bob Harman, in his own unique and entertaining style! Luke, Izzy, Mark – Andy the Automaton Applauds You!! This report is written in homage to my favourite Martin Scorsese film ‘Hugo’, based in Montparnasse railway station in Paris, and features a broken automaton, brought back to life by the orphaned teenage son of a clockmaker who sadly died in a fire. When young Hugo manages to get him working again, the automaton splutters into action, and solves a riddle that leads to much joy and happiness for the family that befriend Hugo and save him from the dreaded orphanage. Much like Hugo’s automaton, Andy does not waste words and has a particular penchant for engine oil, as well as short words and names, and has been known to produce copy often entirely consisting of only four letter words, and naturally containing only four letter names, something dear to his metal heart. So, with the likes of Luke, Izzy, Mark and Andy in top form in the KEGS Dome, our Andy really was like a pig in **** (a pen perhaps?) and more than happy to produce this particular offering in my absence. Andy is actually a very capable automaton when he concentrates, and is well oiled daily to enable his golden arm to operate at full speed and is generally handy enough as his name suggests (and cheap to keep too) and is especially useful during Cheltenham Festival week when his owner is otherwise engaged. Having supplied Andy with the full story of the day’s play, plus all the relevant data from the above results sheet, I asked my metallic mate, in his humble opinion, to inform us all which human(s) shone most brightly on the day, in which order, and who made a lasting impression on him over the course of the day’s play. #Note to Bob from a puzzled Andy: Why does the last-mentioned, Mark James, have two Christian names and no surname? And it seems the human dubbed ‘Cool Hand’ Luke by his underlings, and I bow to his superiority on the day, has two surnames conjoined. It’s a tad greedy that, isn’t it Mr Bob? Can he not simply donate one of his to Mark James? After all you are all born equal on this planet Earth and everyone deserves to at least have a surname, even me maybe? *Note to Andy from Bob – remember well my metal friend that you are not a human, just try to be more like your Marvel superhero The Silver Surfer and stop meddling with things you clearly don’t quite comprehend. Now go and feed the cat, wash the dishes, clean and dust everywhere and then get back to finishing this report or I will be forced to cut your ink ration by half next month and make you watch the new Alan Partridge show on the Beeb, it’s as wooden as you are metal! Ok boss, I will try to stick to my remit and do my best as always. So, having reviewed the evidence available, I conclude that age in short supply is certainly no barrier to success in the BSETTL championships, well not in the year 2019 anyway. After all, Luke is only 15 and surely the youngest Bury men’s singles winner EVER and looked to be on a different planet to everyone else, scooping all the singles titles available to him on the day! Izzy landed the ladies title in close but convincing fashion, remarkable as she is only 13 I am told, and surely is the youngest winner EVER of the ladies singles. I must say I have no prior knowledge of her particular four letter name, but she seems very happy with it and that’s what counts! Her father Paul – yet another four letter name I see, clearly a prerequisite for success – seemed to be a friendly human, always laughing and joking, but I did note that he had the temerity to actually triumph over his daughter in the div 2 final – surely this goes against all the rules of decency and humanity? This human is a bit of an enigma, shame on you Mr Paul! I have to say at this point too that I didn’t particularly like the sound of the long-haired ancient greyish figure with the weird forehand, or indeed Moon ball man sporting the gaudiest orange top, who seemed to be on a totally different timescale to everybody else in the Dome. Is the latter by any chance from the planet Zonk where time stands still and waits for every man? As we all know, Zonks love oranges to the exclusion of almost any other food bar seasonal locusts and I did hear that this individual was between games devouring dozens of large oranges at a pace he most definitely does not display whilst on court – this is of course typical Zonk behaviour, tell me I am right Mr Bob? *Note to Andy from Bob – now look here, I didn’t ask you to pick out potential court jesters or to character assassinate some poor grey guy going about his business or even those Zonks that hide among us who choose to demolish oranges and/or locusts at speed either – just stick to the remit and please don’t upset anyone, I can’t allow this to go to print if you are going to go all Scandinavian on me. I’ll have to stick that quill back in your metallic mitt if you don’t start behaving yourself! Ok boss, point taken and digested – having reviewed yet more evidence, I conclude that the future for the League is shining as brightly as the brightest beacon in Bury, with any number of young Earthlings displaying skills I can only dream about, given my steely metal grip and limited movement. But I do also have some sad news to bring – the most organised human with clearly the best attitude on display while on court, and who has the best name of course – Andy Cullen – has announced this will be his last season in Bury as he is moving away. Is this allowed I wonder? Bury is after all the jewel of East Anglia, Heaven on Earth some suggest, so why would anyone want to leave such a wonderful place? I can only think that his place in the League’s top division will be taken next season by one or more suitable Earthlings, and my latest video review concludes that some young Rougham whippersnappers such as Aidan Stibbs and his pal Leo Saiu-Bell (the latter yet another with two surnames conjoined, is this hyphenating lark becoming an epidemic among you humans?) are now more than ready to take that giant leap for mankind into the hurly burly of the top echelon of the local ping league. Worryingly though, I did view what looked like a mob at the end of the tournament surrounding the control table and slapping their own hands together most vigorously, right in the faces of two very modest looking men seemingly taking cover behind said table – is this a form of self-harming or possibly even latent aggression on show after a frustrating day out on court, Mr Bob? Ok Mr Bob, yet another mystery solved by your good self, dare I suggest you are indeed a man for all seasons and not just a simple fool masquerading as one?! I have heard you mention the word ‘clap’ before many times, but didn’t know it could be used as a verb in that context. So there it is for another year – last but not least though, my sensors did detect a strange odour building up, almost forming a thick mushroom cloud near the ceiling within the Dome as day became night. Is it usual for you humans to run around like headless chickens, sweating profusely and yet not even consider opening a window or a door to clear the rather whiffy smell that flows predominantly from that rather grim area under the top of your arms? Actually, DON’T answer that one Mr Bob, I think I would rather not know the answer! Thirsty work this writing lark, mine’s a WD40 if you are buying Mr Bob? !